The main student grid displays all active students regardless of season. You can uncheck the Enrolled in Season box if you want ot see the students who are not enrolled in the season. 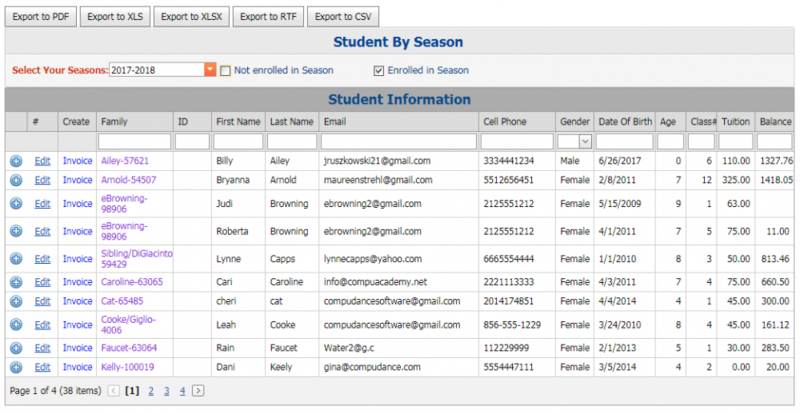 You can only check the Enrolled in Season tab to see the students who are enrolled in the season displayed. This list can be sorted by any column by clicking on the column header. Additionally, you can search for a student by using any of the white search boxes underneath the column headers. This list can also be exported to excel. Click the export to XLS at the top of the page. You may edit the information displayed by clicking Edit on the student line. A form will appear below it. Make your changes and click Update to save. *To update an email or mailing address for the family- make the change in the Family link page. Create an Invoice from the Student List. In front of each student is the link for Invoice. When clicked, it will bring you to Create an invoice for that student. You may change the start and end dates, if you wish. Then click Find again. See the Student Balance in the far right column of the grid. This will be the balance of all open invoices for the specific student regardless of when it is created or due date. There is a detail tab to see the student open invoices under the Student. View family billing from the student grid. Click on the family name from the student page to view family billing, post payments and save payment methods.